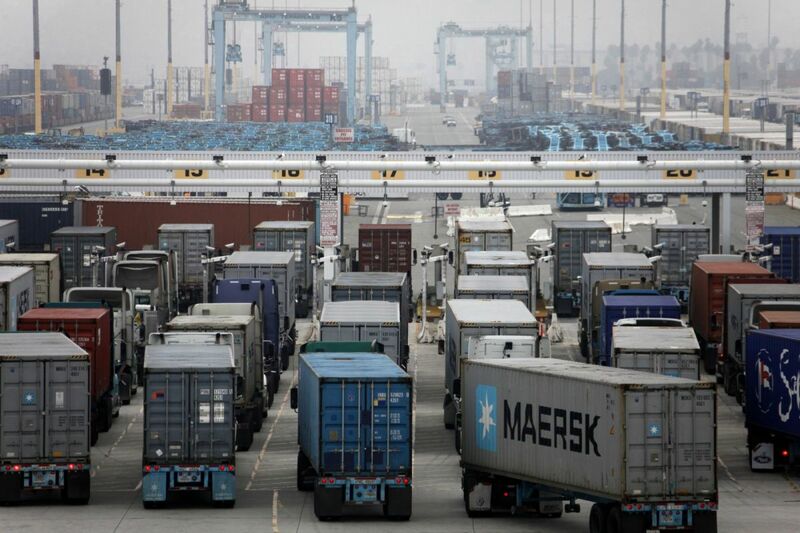 The ports of Los Angeles and Long Beach, the first and second busiest ports in the U.S., are a jigsawed infrascape of water channels and shipping terminals, a skyline built of cranes and steel containers. Together the neighboring ports cover more than 7,500 acres of land – about 12 square miles – and at least that much water. The metropolis of L.A. and Orange County and greater Southern California fans out around the ports, the grand industrial gash in the coastline, endlessly swallowing up and spitting out the commercial goods of the global economy. Superships carrying thousands of containers come in and out every day, an exponential trend line out from the harbor’s roots in the early 1800s when ships sailed in and longshoremen unloaded them by hand. Those days have long since disappeared amid the glaring progression of containerization, port automation and globalization, but some vestiges of the port’s less sophisticated past remain. City Dock 1, a hundred-year-old dock on the far edge of the complex in L.A.’s San Pedro neighborhood, is lined with long warehouses where those longshoremen once loaded and unloaded goods like cotton from Southern California farms and sardines from the canneries nearby. Train tracks still run through the street alongside the now-empty warehouses. Standing on these loading docks, they feel almost ancient. The scene feels even more anachronistic when you look across the water at the nearly 200-foot-tall cranes stacking metal shipping containers like massive toy blocks. This juxtaposition of steam engine old and robot new makes it hard to imagine that this ancient dock will soon house a research and development center that intends to redefine the importance of the waterfront from global commerce to becoming a laboratory of sustainability. AltaSea CEO Rachel Etherington imagines a future in which researchers investigating sea level rise will work alongside technologists developing new tools for undersea exploring, and entrepreneurs testing new ways to use the oceans to feed the world. The goal is to be a world-class research and development campus focused on the environmental issues at the coastal front lines of climate change. Bringing scientists, researchers and businesses together, Etherington believes, will help move the needle on these critical problems that no one sector can solve alone — issues like air and water pollution, sea level rise and the depletion of fisheries. The ambitious project’s first phase is expected rise over the next five years at a cost of $217 million. When fully built out, the project could cost $727 million and rival in size and scope other business incubator projects in L.A., like the Cleantech Corridor project that now has various factories and office buildings under construction downtown. If all goes as planned, AltaSea will bring thousands of new jobs to a part of L.A. that has been losing them for decades. Many of the new jobs will be unlike those San Pedro has known in the past — white-collar instead of blue-collar, and tied to businesses and universities, not unions. They will be jobs in the industries of the future rather than the past — the foundation of a new economy for San Pedro and, hopefully, a driver of research, development and entrepreneurship for the entire region. While other cities, like New York and Boston, are transitioning aging docks and port lands into various commercial redevelopment projects or less economically productive uses like parks, AltaSea is a high-profile attempt at turning a former working port into a new kind of job generator. Rather than abandoning the dock’s maritime utility, AltaSea aims to modernize it in order to take advantage of its economic potential in a new way. It’s not, after all, an easy time to be in the maritime business. With increasing global competition and consolidation, ports and related businesses across the U.S. and around the world are struggling to survive, making it a gamble to invest in an industrial future. If AltaSea works, it could offer a model for other cities with aging and underused seaside infrastructure to get back in the business of being on the waterfront. But before any of that can happen, AltaSea’s got a couple hundred million dollars to raise. The Port of Los Angeles, the bigger of the two neighboring port businesses, is essentially the gatekeeper of American commerce. Last year, it handled 7.9 million 20-foot equivalent units of containers carrying 165.1 million metric revenue tons of goods valued at $285.4 billion. It’s been the biggest port in the U.S. since 2000 and is currently the 16th biggest in the world. It’s a powerful force in the region, a fact that’s sometimes landed it in controversy. In 2004, the port’s then-director, Larry Keller, was forced to resign amid a federal investigation into city contracting practices. Alta Sea was born about two years after Keller stepped down, the brainchild of his successor Geraldine Knatz, who happened to be one of the top-ranking women in the male-dominated U.S. maritime shipping industry and a ph.D in biological sciences. Knatz stepped into a big job. Facing slow growth and increasingly loud complaints from neighbors about pollution and traffic, the port was working with local community groups and then city councilwoman Janice Hahn on a plan for parks and commercial development on the waterfront. The planning sessions, however, were going nowhere fast and ridden with conflicts over what should replace the docks where so many community residents — and their parents and grandparents — had once labored. Knatz thought the port needed to streamline its focus. So she started looking around for new opportunities to bring in new businesses. And then she noticed City Dock 1. The dock has more than 4,000 linear feet of waterfront access and wharf space, and its main buildings are a long three-section warehouse covering more than four acres, another roughly one-acre warehouse, a six-story storage facility that’s listed on the National Register of Historic Places, and the former site of a chemical company’s tank storage facility. Except for the historic storage facility, none of the other sites were being used. She called Dr. Rick Pieper. He was then the director of the Southern California Marine Institute, a consortium of universities and colleges in the region that had, in one form or another, been using waterfront labs at the port since the 1980s. Knatz asked Pieper if he’d be interested in moving to one of the vacant spaces on City Dock 1. “My chin kind of dropped on my chest,” Pieper recalls. The proposed move would nearly triple the institute’s space and offer researchers better proximity to the water they rely upon for their work. For Pieper it was an easy yes. The institute’s board of directors, with representatives from the California State University, the University of Southern California, Occidental College and later UCLA, agreed. In Knatz’s view, moving the institute onto the dock was more than just a favor to some marine biologists. She had found the anchor for a dramatic redevelopment of the dilapidated dock. “My vision for the port was that we protect our core business, which is container, which generates 80 percent of the port’s revenue and has a lot of good jobs with it, but that we build clusters of other jobs that take advantage of the marine environment,” says Knatz, who’s now a professor of public policy and engineering at the University of Southern California since retiring from the port at the end of 2013. And though the idea made sense for both the port and the institute, nobody had the money to turn the vision into reality. So, like many plans, it sat on the shelf. But Knatz kept the idea alive. In late 2006 or early 2007 she gave a talk at a luncheon for women in philanthropy, and casually mentioned the idea of using the old dock to house a new marine research and business hub. A few days later she got a call from Wallis Annenberg, president and CEO of the Annenberg Foundation, which focuses heavily on job creation and economic development. Knatz says Annenberg told her the foundation was interested in helping, and they commissioned a study to develop the idea. About 18 months later, in March 2009, the port and the foundation released a hefty study exploring the feasibility of taking the first step towards redeveloping the dock as a home for the research institute. The study estimated that rehabilitating the smallest of the buildings on the dock would cost around $25 million at the least. It also identified other researchers and related fields that could benefit from a waterfront location, including public agencies such as National Oceanic and Atmospheric Administration and the Department of Fish and Game. The dock, the study envisioned, could become a modern marine complex. But this was 2009. The global economy had recently nearly imploded, and it wasn’t easy to find the multiple millions of dollars needed to do even a small part of what was looking like a multi-phase project. So, again, the project went into hibernation mode. Knatz kept the project in the back of her mind, however, and kept looking for ways to make it happen. She spent the next few years working behind the scenes. Finally, in 2013, the City Council, with the support of Mayor Eric Garcetti, approved a 50-year-lease to transform the 100-year-old dock 1 into AltaSea, a world-class urban marine research and innovation center. The lease signed between the Port of Los Angeles and a fiscal sponsor, Rockefeller Philanthropy Advisors, called for the modernization of the dock, the establishment of the marine institute’s research facility and interpretive center, as well as later phases that include the redevelopment of the other warehouse spaces on the dock, the creation of a marine business incubator and even plans for a massive wave tank to study tsunamis and rogue waves. In total, it was a vision for a $500 million, 15- to 20-year project estimated to create thousands of jobs — both temporary trade work and permanent white-collar positions — and to generate billions of dollars for the local and regional economies. The Annenberg Foundation kicked in $25 million to start the process, and the Port of L.A. dedicated $32 million for infrastructure improvements and the renovation of the aging dock. In March 2014, the nonprofit now known as AltaSea hired its CEO, Rachel Etherington. Since then she’s been busy selling the idea to funders and getting potential tenants interested in relocating as the space develops. “To have this prime waterfront real estate is very, very valuable. So we feel very confident that there will be no shortage of interest,” she says. As of mid-October, about six to eight organizations – “50 percent of which are very, very high profile,” Etherington says – have already indicated interest in moving in. Though port and waterfront redevelopment projects are happening all over the world, few are like AltaSea. In Hamburg, a former harbor area is in the midst of a large-scale conversion into a mixed-use new downtown known as HafenCity. In London the once prominent port at the Canary Wharf was converted into a new downtown financial center and urban development site in the late 1980s. 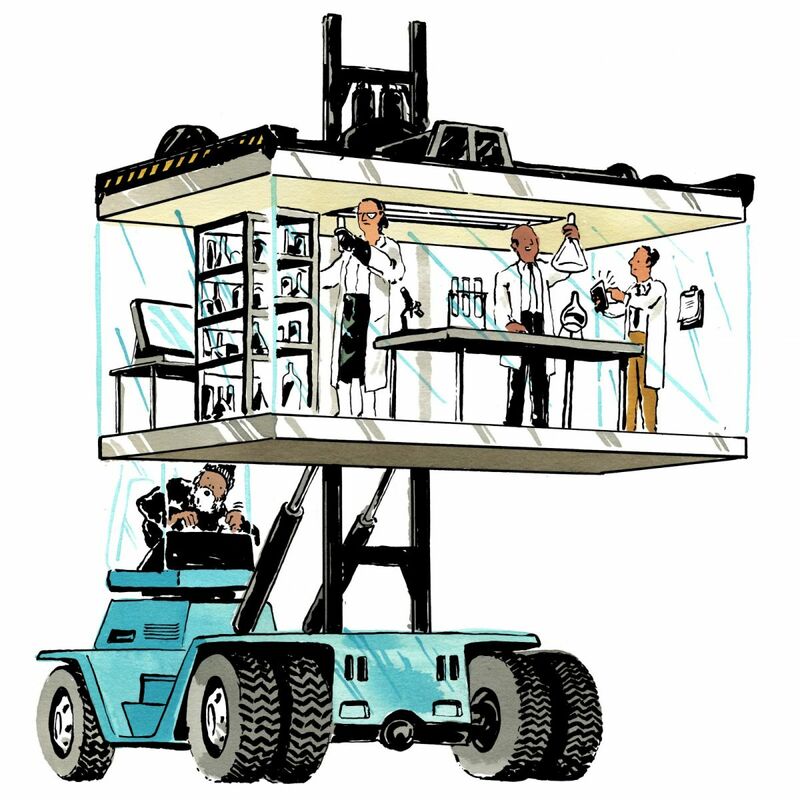 In New York, shipbuilding facilities at the Brooklyn Navy Yard are being repurposed as an industrial park full of small- and medium-scale manufacturers, industrial designers and technology companies. In Boston, 1,000 acres of underdeveloped waterfront have been rebranded as an “innovation district” with business incubators, tech startups, media companies and other creative industries. But AltaSea is unique in its intent to refresh the waterfront’s utility by updating its infrastructure and capacity to house the waterfront industries and innovations of the 21st century. And for the blue-collar community around AltaSea, the project offers a chance to create a more economically sustainable future. The Port of L.A. sits at a remote tip of Los Angeles. In order to keep the port under the umbrella of the city of L.A., its borders cleaved through neighboring communities about 25 miles south of downtown along a narrow strip – sometimes just blocks wide – to expand out and around the harbor area. It was a jurisdictionally strategic move, and the Port of L.A., which is officially a department of the city, directly and indirectly generates billions of dollars for the local economy. In 2013 it had a net income of more than $85 million. And many of those families are still in San Pedro. Robbins says it’s not uncommon to talk to people and hear about their great-grandfathers working in canneries on what are now container yards, or that families have been there for more than a hundred years. But while the generations of the past had steady jobs in the canneries or on the docks, both of the fishing and shipping industries have undergone dramatic changes in recent decades. Robbins says most of the fishing and canning jobs evaporated as those markets relocated overseas. And at the port itself, modernization reduced the workforce of longshoremen and related tradespeople from upwards of 100,000 to just about 15,000 employees today, according to Knatz. “The actual business of moving cargo has changed, logistics has changed, and somebody can sit at a computer in Ontario and be doing port work. So in some ways there’s been a loss of that strong connection with the people and the community,” Knatz says. He concedes that not everyone in town is supportive of the project. “Very, very few” are against the development, he says – mostly older people who worry about how the projects on the waterfront might change the community’s character. He himself was one of them just a few years back, but now says he sees only positive impacts. The first phase of the AltaSea project may help on the economic front. In addition to the proposed new facility for SCMI, plans also include an interpretive center where the researchers can exhibit their work in a publicly accessible museum-like setting. It’s both an educational opportunity and a way to perhaps plant a seed in minds of area youth that there’s a viable professional future at the waterfront. AltaSea isn’t the first effort to revitalize the area. A number of plans are in various stages of implementation to bring more jobs, more life and more money to San Pedro. Over the last decade, the port, the neighborhood and the city have collaborated on several efforts to convert underused port properties into places the public can enjoy. A promenade running from the cruise ship terminal to the ocean opened in 2004 and is now a popular among joggers and cyclists. A “gateway plaza” opened in 2008 now serves as the entryway to the waterfront area, with choreographed water jets synchronized to music and lights. Kids play in other fountains nearby, and people stroll beneath palm trees as they wait to board ferries to Catalina Island. Nearby, a replica of the old Los Angeles Red Car trolley runs a novelty weekend route along the waterfront, taking visitors from the cruise terminal out to the edge of City Dock 1, and on the San Pedro waterfront, a newly renovated marina welcomes tourists and local boaters. There is also a 30-acre park at the edge of a large slip, where residents can be found sunbathing and flying kites. At the edges of the port complex, it’s not uncommon to see people, generally older men, sitting on benches or in their parked cars, looking out on the maritime traffic gliding into and out of the port’s massive channels. Most recently, in 2012, two former port warehouses were converted into “Crafted,” a 500-stall venue for local craftspeople, food vendors and artists. But for all the new waterfront flair, the main attraction of San Pedro has always been Ports O’ Call Village, a waterfront string of gift shops and fish restaurants modeled after a New England fishing village. It first opened in 1963 and you can tell; its winding walkways, quaint buildings and cheesy art shops are reminiscent of a struggling theme park, which it sort of is. Until the weekend anyway. The highlight of Ports O’ Call is its fish market, a collection of restaurants serving fish and shellfish by the pound that becomes a wonderland for hungry mouths on Saturday and Sundays. “It has 1,800 seats and you stand in line outside for an hour to get in on Sunday,” says Robbins. The village could use a refresh, though, and in fact it has needed one for decades. But one finally seems on the way — a team of developers is moving ahead, albeit slowly, with plans to redevelop the site and bring Ports O’ Call into the 21st century. There’s hope that Ports O’ Call and AltaSea can help each other – the retail development providing lunch options for researchers and businesspeople, the educational aspect of the R&D site acting as another reason for people to come down to the waterfront and maybe order up a plateful of shrimp while they’re there. Now it’s up to Etherington to make that case. Etherington is settling into her role as CEO and chief fundraiser. She says she’s had a “soft launch” of AltaSea’s fundraising campaign, and is targeting foundations, individual investors, public sources, corporate sources – basically anybody with some money to spare. The Port of L.A. has committed a total of $57 million, mostly to renovate and rebuild the physical infrastructure of City Dock 1. Along with the Annenberg Foundation’s $25 million in seed funding, AltaSea has about $82 million in the bank. That leaves $135 million needed to cover the project’s $217 million first phase of development, including the new home for the marine institute and the public learning center to be designed by William McDonough. The CEO says she has built up a database of about 400 qualified prospects who could potentially donate or invest the kind of money AltaSea needs to make a dent on the project. Etherington says she’s got her eye on the top 25 of those unnamed prospects, some of whom have coffers robust enough to match or even surpass the Annenberg contribution. She’s confident the money will come through. For insiders at the port and the marine institute though, there are still doubts. The project has been in the works since 2006, but there’s not a lot of progress to be seen. And some, like Pieper, suggest that luring the businesses and funding to complete the vision will be a challenge until there’s more physical evidence that such an idea can take shape. “I don’t think they can be successful at doing the fundraising until they get something over there,” he says. Ports are changing the way they do business but doesn’t mean that industry no longer has a place on the waterfront. Maritime industry is about much more than simply moving containers from place to place and cities must think creatively about how to connect its different sectors. 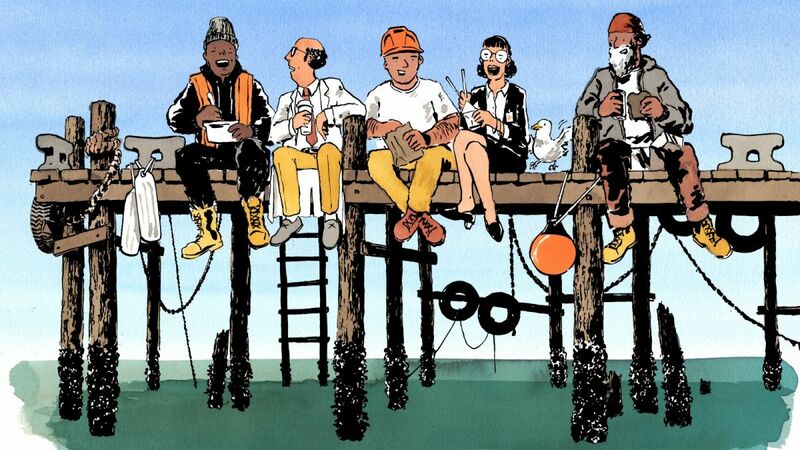 Scientists, tourists, entrepreneurs and longshoremen all deserve a place on the waterfront and with the right collaborative approach, there is no reason why they can’t all be there. Fawcett, who wrote the study essentially making the case for the project, says that it’s less a matter of proving the project is achievable than making the case for how much benefit it could bring. “The real challenge is going to be explaining to the philanthropic community how important this is, how this could be a real asset to the region,” he says. Selling that somewhat amorphous idea won’t be easy, but most people inside and outside the project are hopeful that it will eventually work out. The benefits, they say, are just too good to ignore: the research and development potential, the synergies between the various institutions and businesses, the impact on environmental sciences, the potential invention of all sorts of world-changing technologies and ideas.